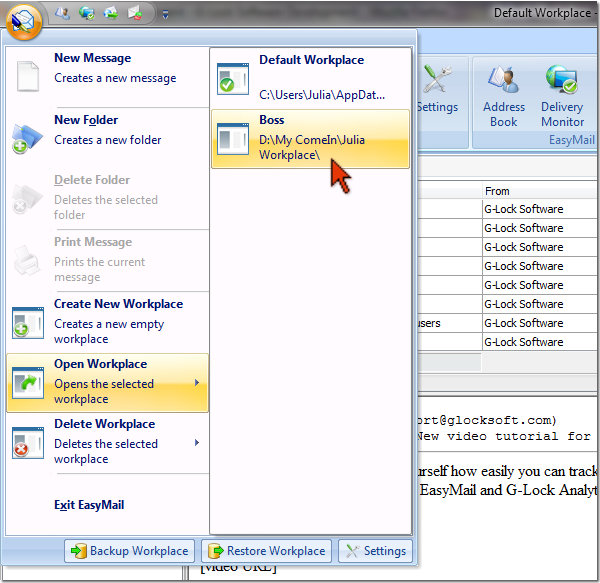 In 'G-Lock EasyMail Business edition' you can create a unique workplace [which includes email messages, contacts, program settings and accounts] for each of your clients and easily switch between the workplaces inside the program. See the potential? Firstly, it's like having your own email marketing service — you can create many workplaces, run email campaigns for third party companies and individuals and see the cash flowing into your pocket. Secondly, it's a great possibility to outsource and delegate email marketing when multiple users run email campaigns sharing the same data. Let's say you installed G-Lock EasyMail on 3 computers at your office. You create a workplace on a shared disk and now 2 other users of G-Lock EasyMail can access this workplace from on their computers. When one user updates the address book, or creates a new message, the changes are automatically recognized when another user opens this workplace on his computer. No need to manually synchronize the data for all G-Lock EasyMail users which means you save precious time and can organize your team work in the most convenient way for you.